By dramatically reducing stamping-lubricant consumption and related maintenance headaches and costs, this high-speed stamper looks to make a big impact in the lithium-battery and medical/dental markets. A custom fabricator conducts a power-consumption runoff pitting a CO2 laser vs. a fiber laser, cutting steel and aluminum sheet. The stunning results convinced management that the relatively new fiber-laser technology was well worth the investment. Machine-to-machine monitoring catalyzes efforts to raise overall equipment effectiveness to world-class levels at Magellan Aerospace, saving the company more than $30,000/month in downtime-related costs. 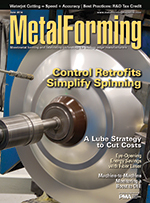 As reshoring gains momentum among U.S. manufacturers, metalformers must be positioned to take advantage. Follow the guidelines offered here to generate leads so that your company can capture, and nurture, new business opportunities.